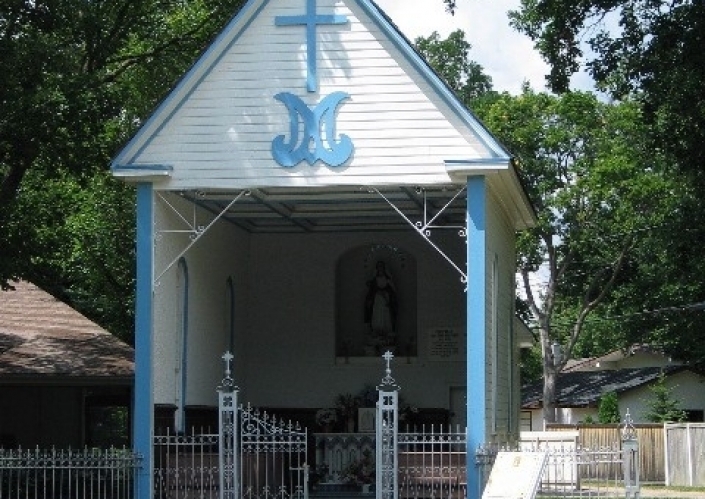 Father Ritchot, former parish priest, built the chapel in fulfillment of a promise that he had made in the hopes that the political crisis of 1869-1870 could be resolved without bloodshed. Inside, there is a statue of the Virgin Mary made of papier mâché. She is holding a small stem on which a small ball is leaning downwards, a symbol of the Métis victory over the Canadian government. The chapel ceiling was originally decorated by frescoes from Constantin Tauffenbach, and in 1994 was re-adorned with identical paintings by the Franco-Manitoban artist Robert Freynet. The chapel received recognition as a provincial historic site in 1989.